Douglas Gorsline. Christmas from the Gorslines. Etching. 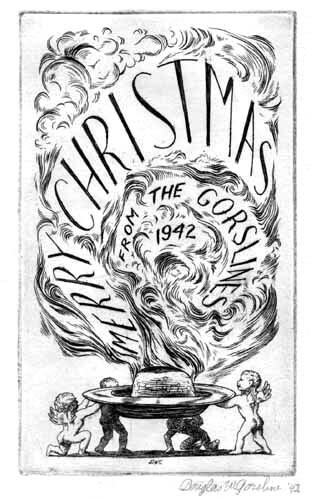 Allinson Gallery, Inc.
Christmas from the Gorslines. 1942. Etching. 4 7/8 x 2 7/8 (sheet 8 3/4 x 5 7/8). A fine impression on off-white laid paper with deckle edges on 2 sides. Excellent condition apart from two stains from old hinges in the top corners. Signed and dated in pencil. $175. Tor order, to report broken links or to be placed on the email list, contact Jane Allinson (allinson@earthlink.net) or fax (860)429-2825.